So...I may have broken the Cardinal rule of Holiday decorating. Namely, I mixed Thanksgiving decorations with Christmas decorations. I know, I know, it was wrong and I'm sorry all right?! But I went to Walmart recently to pick up a set of jumper cables, and wouldn't you know they were playing Christmas Carols? I hummed White Christmas for the rest of the day, then when I went into the laundry room what did I see? 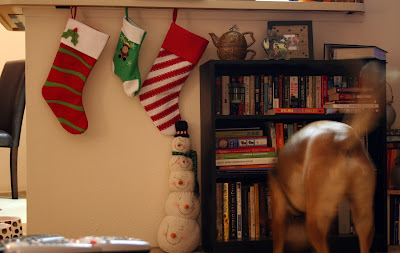 Our stockings. Just sitting there, waiting patiently for their day in the sun. I couldn't resist. I was drawn to them like a moth to a flame. I'm sorry, please forgive me. I swear...that's as far as I went. Well, there is that little snowman there, but how could I resist all those cheery carrot noses? Nevermind that Jaco ate all the eyeballs off last winter...he is still pretty darn cute if you ask me! (He being the snowman, not Jaco...Jaco is a pistol) . Matt thinks this does not bode well for the holiday season. He thinks I am going to burn out on Christmas spirit. He has no faith! He is probably right. I already have most of our Christmas shopping finished, I bought most of our gifts for our family off of Etsy. I would show you guys the gifts, but I have family that reads this...and those little scheisters would definitely peek! Um...I mean...I love you guys! Don't look in my closet! How about you guys? Where do you stand on the Christmas season? Have you started shopping? Decorating? Eating cookies? I think I might go watch Elf now. Gosh darn it I love that movie! And now I have your title song stuck in my head. Thanks for that. i haven't gotten any shopping done yet although we do know what we're getting our moms. i love christmas. absolutely love it. i cannot wait to pull out the decorations every year...but i've managed to hold myself off until the day after thanksgiving...so far. i do listen to christmas music year-round though. Oh dear.. I don't start thinking about Christmas until Dec 1 and thenI panic big-time! awwwwww...precious! I still have spider webbing hanging around that needs to come down! I work in retail so I see Christmas in August. The local radio station starts playing 24 hour Christmas music starting this Friday. The cat destroys my tree every year and I'm almost afraid to see what the puppy does. I have a feeling I won't have a house left! I think everyone is getting gift cards this year! Um, yes, that's definitely a cardinal rule! Lol, but I don't blame you. I have not started shopping, but I do have my list. I pretty much know what I will be buying for everyone. This year I made quite a few gifts too. I see nothing wrong with decorating a little early or getting all of you shopping done in November. Afterall, shopping early can only boost the economy. Yep, I guess you can tell my my blog makeover, I am ready. I am finished shopping, except for my two kids, but almost done. I may even put the tree up next weekend, not decorated. My daughter is having her wisdom teeth out on friday, and I may have my hands full after that! Oh, and I am all done shopping for my giveaway items, be sure to check in on Sunday, that is the start of the 5 week giveaway. I figure you're right on track. I imagine that next week, the Christmas movies will be on TV, and when I look outside, I see people around me with their outside holiday lights on. It's one of those like it or not situations! I've been singing Christmas carols all day. I need to finish up my shopping, though. You are a gal after my own heart! You go on with your Christmas decorations! I am already full of the holiday spirit myself! I loaded about a trillion Christmas songs on my iPod this week and am jonesing for XM to start playing carols on their stations. I went to a holiday open house last night and spent WAY too much on Christmas stuff that I will have mix in with the existing stuff and tell my husband "Oh - this old thing...?" I have a Christmas tree (mini) on the floor at my home office that I secretly turn on during the day when no one is home. I started christmas shopping somewhat. Mostly for John. I am with you on the decorating. This year I am just so excited and have no clue why. Usually we get our tree the day after thanksgiving! We are going to start pulling out our decorations for outside this weekend and go through them! I can't wait! I watched Elf AND Bad Santa this week. Heh. I couldn't resist. Normally I don't decorate until the day after Thanksgiving cuz that's when we go cut down our tree, but for some reason this year, it's KILLING me to wait! I might have to throw just a COUPLE Christmas-y things up to hold me over. ;-) So no, I don't think you're crazy at all! I want to decorate for Christmas! I am forcing myself to hold off until after we get back from TG with my family. I don't want to get burnt out too early. I must say, though, that the Christmas music playing in the stores is driving me batty and making me want to buy all the Christmas decor! I love the movie Elf too! I LOVE Christmas!! I have started my shopping. Thinkin' about watching The Christmas Story this weekend. It is my all time favorite besides the old Miracle on 34th Street and National Lampoon's Christmas Vacation. Can't wait to decorate.